The conference has three panels, each devoted to one of these debates. Each panel includes one keynote presentation from an expert on the topic, comments from two respondents, followed by discussion with the audience. The Murphy Institute is pleased to present the Spring 2018 Civic Engagement & Leadership Development series for union members, organizers, activists, and aspiring politicians to deepen their thinking about ways to engage the democratic process and learn new skills related to effective participation in electoral, legislative, and other civic activity. This free 10 week series is a great opportunity to engage with CUNY faculty and other experts in civic engagement, politics, history mass movements, and public policymaking; broaden your network; and earn a certificate of completion. This is session will provide an overview of the course as well as familiarize students with basic concepts underpinning the vital role of civic engagement plays in expanding and extending participation in the democratic process. This session will also survey civic engagement challenges and experiences that have emerged in the contemporary context. This session utilizes pivotal moments and movements to illustrate several uniquely innovative ways in which citizens have exercised “the right of the people peaceably to assemble, and to petition the Government for a redress of grievances.” Particular attention will be given to drawing parallels between pivotal movements and moments in U.S. historical experience that successfully impacted public policy and governance in ways that expanded democracy and contemporary issues, dynamics, and challenges that face the United States today. Power analysis is a tool that many community organizations, civic movements, and issue-based coalitions use to understand how political power is wielded in a given jurisdiction, by whom, and to what degree in relation to particular public issues and policy concerns. Students will be tutored in using power analysis to discern and assess the power analysis political actors wield in their own community. Students will also devise strategies and tactics for building or broadening civic engagement in these jurisdictions. This session examines the “creative tension” between demographic diversity and the capacity of the political system to include “all the people.” Students will discuss whether or not there is validity to the notion that “demographics are destiny in politics” in light of racial and partisan gerrymandering in redistricting, voter suppression legislation and regulations, and low minority and young voter turnout. Attention will also be given to the importance of achieving an accurate census count in 2020 and post-census mobilization around redistricting. Students will also explore ways to identify, incorporate, and utilize strengths arising from diversity. Students will survey a variety of skills, techniques, and strategies employed to advocate issues between and during election cycles, as well as examine the ways in which organizing and mobilizing constituencies in electoral and non-electoral contexts overlap. Students will also take part in designing approaches that unions or community-based organizations might undertake to successfully advocate their issues while transitioning to and from electoral and non-electoral contexts. What if the candidate(s) your union, organization, or coalition supported wins? What if that election also results in this candidate’s party keeping or gaining control of the legislative and/or the executive branch? But, what if the candidate(s) your union, organization, or coalition supported wins? What if his or her party maintains or regains control of the legislative and/or executive branch? What are civic engagement challenges going forward? This session focuses on the post-election challenges leaders and activists face in transitioning from campaigning to governing, including how to respond to favorable or cope with unfavorable results; how to adjust to a new political situation; and how to influence the policy priorities and staff appointments of the elected officials your union, community organization or coalition supported or how to deal with a winning candidate your union, community organization or coalition opposed. Civic engagement movements focus on public policy or otherwise attempt to compel government to favorably respond to their concerns. This session provides a basic understanding of the rules, procedures, mechanics, pressure points, and institutional participants in the policymaking process. Special attention will be given to lobbying tactics and techniques civic movements, issue coalitions, community-based organizations, labor organizations, and particularly political parties use to influence policymakers, build a policy consensus, and mobilize alliances with the legislative and executive branches to enact legislation. Students will apply what they have learned in this session to constructing their own model for engaging the policymaking process. Existing programs require continuous funding. New programs require new appropriations. The budget process is the central institutional vehicle governments use to decide “who gets what, and how much.” This session examines how unions, civic movements, and issue-based coalitions navigate their priorities through the New York City and New York State budget processes. Civic engagement involves mobilizing communities to pressure government to address their concerns while politically empowering themselves in the process. This session focuses on the knowledge and skills community leaders and grassroots activists need in regard to applying outside pressure on decision-makers and government institutions; direct participation in policymaking, advisory, and quasi-governmental entities, and exercising influence through political parties, campaigns, and elections. This session focuses on key challenges leaders and activists face in the context of the 2018 midterm congressional, gubernatorial, and state legislative elections. Discussion will center on ways in which the students — based on what they have learned — think civic engagement initiatives should tackle overlapping local, state, and national political dynamics. Attend at least 7 sessions and receive a certificate of completion. For questions or more information, email murphyinstitute@cuny.edu or call 212-642-2081. To be eligible for the Diversity Scholarship, you must apply to and be accepted into the MA in Labor Studies, or the BA in Urban and Community Studies, labor concentration. Graduate applicants contact Laurie Kellogg, Labor Programs Specialist. Please text or call day or eve: 718-440-1550 or email Laurie.Kellogg@cuny.edu. Undergraduates contact Cherise Mullings, Enrollment Specialist, Urban Studies, at 212-642-2059 or at Cherise.Mullings@cuny.edu. Please attend an Open House at 6 pm on January 18, 2018, at The Murphy Institute, 25 West 43rd St., 18th Floor, NYC. Become a better advocate for labor rights and social justice! 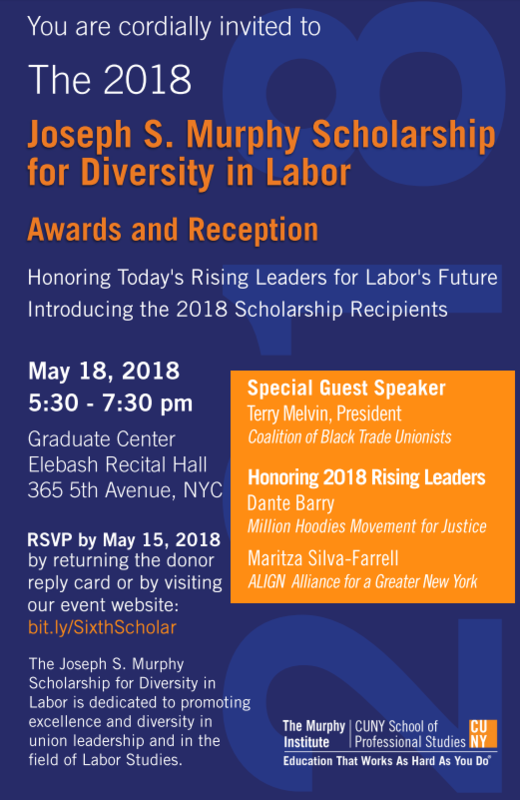 The Murphy Institute for Worker Education and Labor Studies at the CUNY School of Professional Studies (CUNY SPS) is seeking applicants for the Diversity Scholarships, which are dedicated to supporting diversity in leadership in the labor movement and in the field of Labor Studies. Please visit the Murphy Institute website for more information: www.WorkerEd.org 212-642-2083. 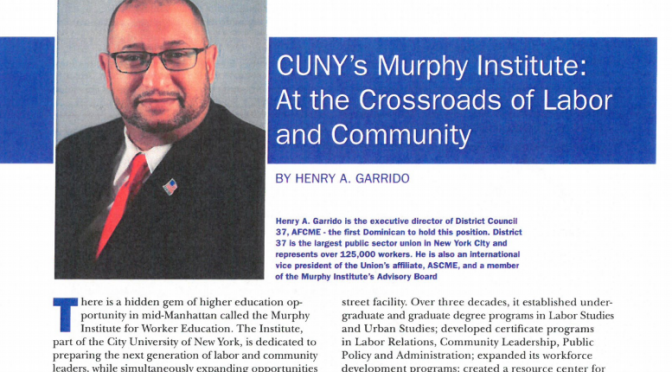 There is a hidden gem of higher education opportunity in mid-Manhattan called the Murphy Institute for Worker Education. The Institute, part of the City University of New York, is dedicated to preparing the next generation of labor and community leaders, while simultaneously expanding opportunities for working adults in a wide range of fields throughout the CUNY system and in all five boroughs. The Institute has its roots in a small program established in 1984 at Queens College as the brainchild of three unions: Local 1180 of the Communications Workers of America, District Council 37-AFSCME, and the Amalgamated Clothing and Textile Workers Union. These unions shared a vision of empowerment through education—not only for their own members, but for adult workers more broadly and for the future of the labor movement as a whole. Most of the original 52 students were municipal employees and women of color. For more on the history of the Murphy Institute and where things are going from here, check out it out. Each season, the Murphy Institute brings incisive public programming about the political and social issues facing our city, our country and our world. This fall, we’re going deep on our democracy, our history and ourselves, exploring where we’ve been and where we might go from here. We begin this season with debate and strategic thinking regarding two major cases before the Supreme Court, opening with Gill v. Whitford on the practice of redistricting through partisan gerrymandering. We will then turn to the future of public sector unions, made precarious by the pending Janus v. AFSCME case. We will also be looking closer to home by examining, together with Hunter College’s National Center for the Study of Collective Bargaining in Higher Education and the Professions, the 50th anniversary of the the Public Employees Fair Employment Act, commonly known as the Taylor Law. Also of special concern to New Yorkers is the City’s current transit crisis, an issue we’ll explore in a forum that will discuss solutions to enable New York to sustain itself as a world-class city. We will round out the year by marking the 20th anniversary of the Murphy Institute’s journal, New Labor Forum, and use this occasion to assess efforts to rebuild a working-class movement that the journal has for two decades debated and discussed. It all kicks off on Friday, September 15th with Divided Results: Voting and Partisan Gerrymandering. Then, look forward to The Taylor Law in Perspective at 50, to be held September 26 at Roosevelt House, Hunter College. Stay tuned for more details as the fall gets underway!